Updated March 7, 2019 - Fixed a bug in the script for version 4a. Users of the non-scripted version 4 do not need to update. For the scripted version make sure you have the latest script, the modification date on it should show as March 7. Version 4 works like the original and does not require any script. 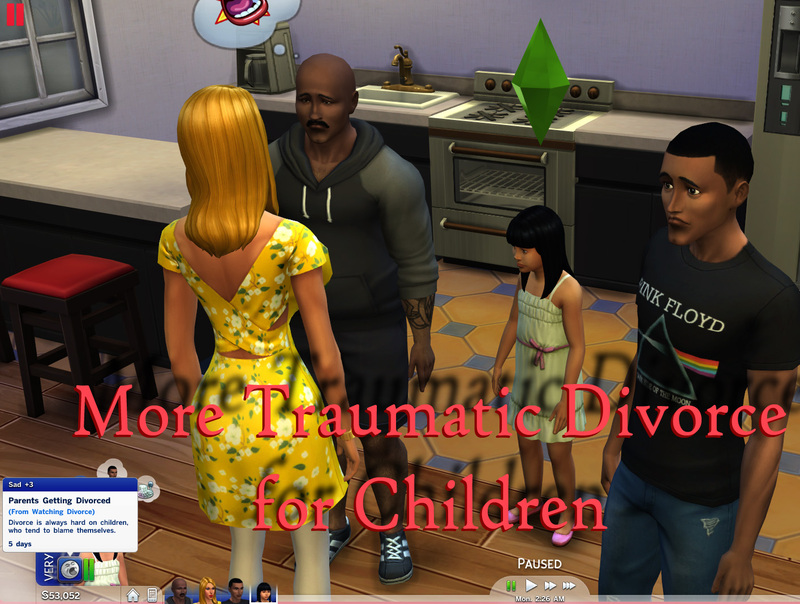 Version 4a contains a script that will allow children Sims on another floor of the house to react to the divorce and get the sad buff. It will still not enable children off the lot to react. Children and teens will now cancel most actions to react to the divorce. Both parents will now broadcast the divorce to the children. Now if a child's step-mother divorces their father they will react appropriately rather than ignoring the situation (since step-mom isn't really their mother). 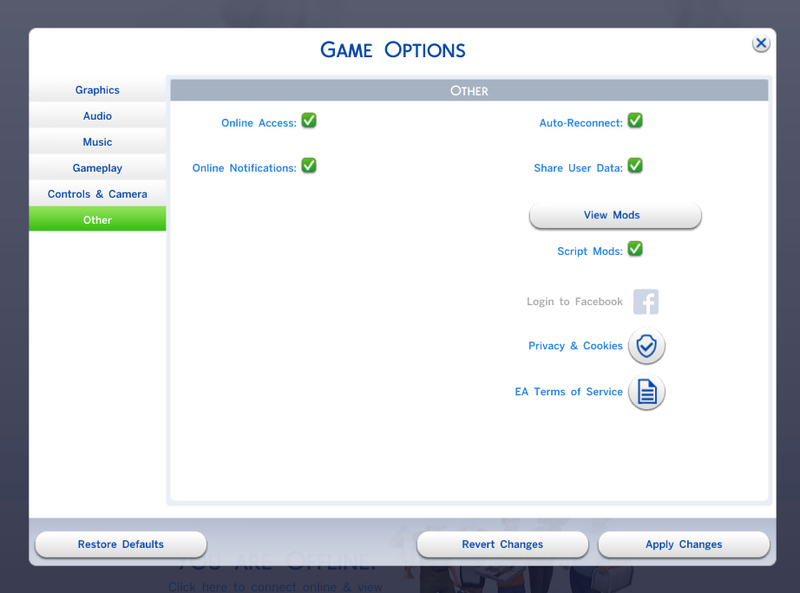 Child sims should get a sad mood even if they were busy and missed the divorce. Broadcasters still don't travel stairs (game limitation), so they still won't notice the divorce at all if they are on a different floor or on a different lot (out to school). Various improvements to the way the broadcasting worked to optimize and make the reactions more reliable. "Divorce is always hard on children..." the game claims -- well, not really hard, just a tiny bit depressing if they happen to be there to witness it. Even then it only takes four hours for them to get over it completely! This mod increases the sadness level for children to +3 and the duration increases to 5 days. Teens didn't get sad at all, they just ignored the divorce. I think this was a bug or oversight as some of the files reference teens, but not all of them. This will give teens a sadness of only +2 for 4 days (since they're hopefully a bit more emotionally stable than children). In addition, the news of the divorce will be broadcast to as many children as possible, not just those who happen to witness it. Due to the limitations currently in the game, news doesn't travel up or down a flight of stairs or to those on another lot, so children that aren't on the same floor or that are off to school will be blissfully unaware of the unhappy event. However, this mod does make the news travel to children on the other side of the wall, or if on the ground floor, playing out in the yard or even jogging down the block. So, it's an improvement, but not really perfect. Hopefully someone will determine how to make news go up a flight of steps soon! Just unzip the package file to your Mods folder as usual. If you are using version 3a of the mod then you must install both the v3a version of the package and the script file. This may be of interest if you are experiencing a conflict and know how to debug such issues, or if you are creating another mod affecting divorce reactions and wish to incorporate these changes to eliminate conflicts. If you do create another mod using these changes, I would appreciate receiving credit. As always, the authors of S4PE.